Marble-effect slabs in the size 162x324 cm. 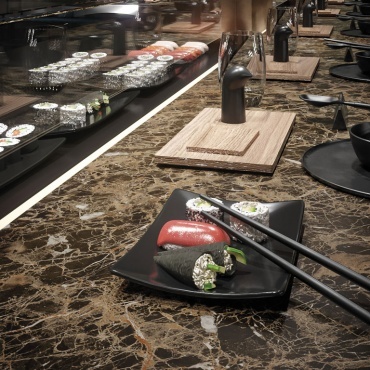 Characterized by a lavish dark brown colour with warm hazelnut and cream coloured veining, Emperador Dark is the perfect material for luxury settings such as restaurants, resorts and hotels, but also exclusive kitchens. The dark colour brings personality and character to spaces and can be used in conjunction with other materials to create superb colour contrasts. 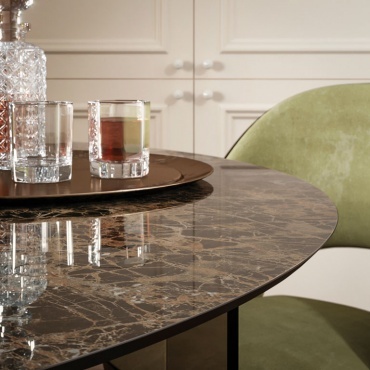 Emperador Dark is available in silk finish with a thickness of 12 mm. Ideal for use in domestic settings as well as commercial buildings: from kitchen worktops to bar and restaurant tables and counters, for spaces that exude design sophistication. Emperador Dark Habitat: Emperador Dark silk slabs by Atlas Plan are paired with Kliff Dark by Atlas Concorde. Materials, textiles and accessories recreate the magical atmosphere of metropolitan bars and clubs.